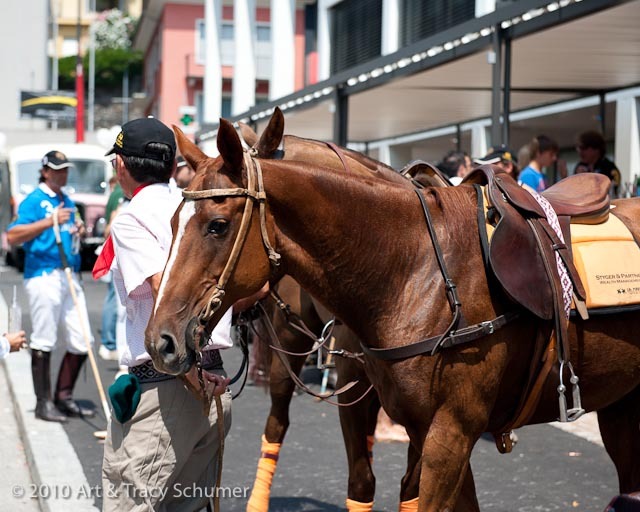 The charming lakeside village of Ascona in southern Switzerland formed the backdrop for an arena polo tournament. When people think polo, they often have visions of fast horses carrying colorful players across large areas of fresh turf but this is arena polo- it’s quite different. 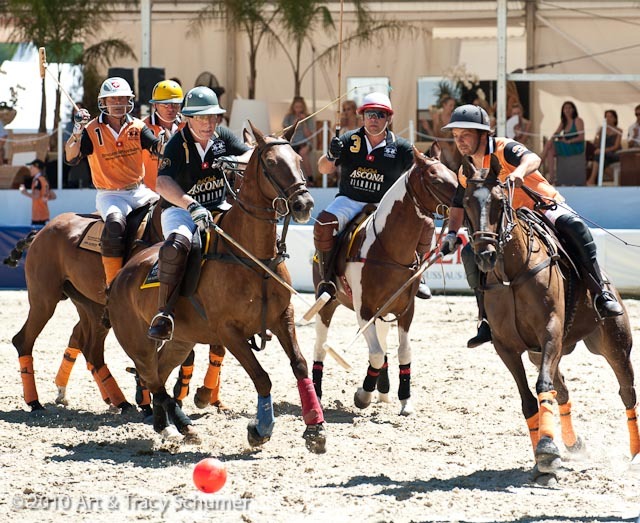 Instead of a 300 meter long grass field or “pitch”, the Ascona Polo Cup is played on 50×80 meters of sand. For some, the idea of playing Polo on anything other than turf may seem unusual but the game is played around the world on all sorts of ground. Like with tennis; the French Open played on clay for example or the grass courts of Wimbledon, playing polo on different surfaces is common in Europe. Polo is even played on snow in the mountains of Switzerland at the famous winter resort town of St. Moritz. Christine Bär played the number one position for the Ascona tournament’s second highest scoring team; Julius Bär, “Arena polo is much more physical, the horses can’t run as fast because the field is much smaller but they don’t get tired like they would running on a full sized field.” This fact means the horses stay fresh throughout every chukka, so the energy of each match stays at a high level to the end. 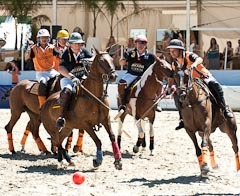 What arena polo may lack in long stretches of galloping, it more than makes up for in the amount of action on the field. The players battle like gladiators while riding at speed in an enclosed space which is more in line with the historic nature of the game; that of combat training for calvary. The origins of polo can be traced back to ancient Persia, with some historical accounts dating the game to around 2000 BC. English military officers serving in Calcutta, India, picked up the game from local horsemen and formed the first polo club in 1834. Today, modern polo is played in 77 countries around the world with the FIP Polo World Championship tournament played every three years. 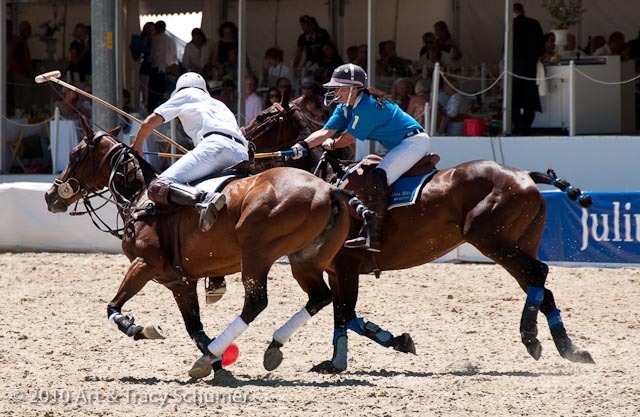 The name “polo” comes from the Tibetan word for ball; Pulu. My own experience with polo began in my home town of Sarasota, Florida, which has had an active polo club since 1922. Polo in Florida tends to be casual, we often showed up for matches with our own folding chairs and a picnic cooler. The Ascona tournament was a more classy affair. Polo club members enjoyed gourmet catering and Laurent-Pierre Champagne while watching the players gallop past the front of their linen covered tables in the VIP tent. A popular local restaurant set up a trendy bar and lounge along the other side of the field and even created a night club for the saturday evening match. The party lasted late into the night, long after the “ponies” had all been put to bed in their stalls. The weekend kick-off was a parade of players, horses and Maserati cars down the Lungolago, Ascona’s famous waterfront. 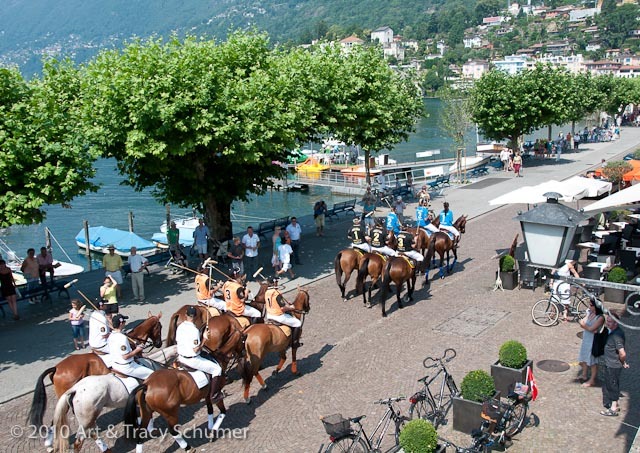 Once the horses and Italian horsepower reached the end of the waterfront, everyone stopped for a champagne toast. 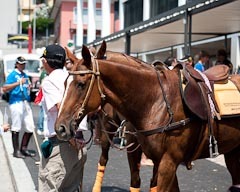 Then the riders headed out again and accompanied by the roar of Maserati engines, continued on through the back streets of Ascona until they all landed at another fashionable bar for more refreshments. The horses were gathered calmly on the street and didn’t seem to mind all the commotion around them. After a few more toasts, the players mounted up and it was back to the barns to get ready for game time later that evening. 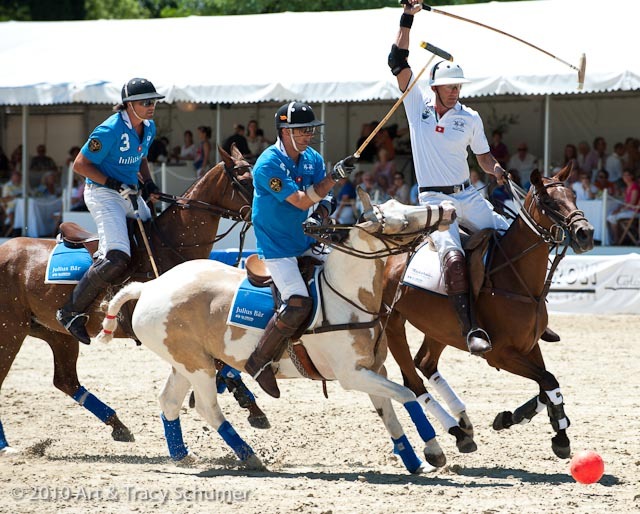 From a horsemanship perspective, polo players are highly confident riders- the nature of the game demands it. There’s always risk involved with polo, the high speed and sudden changes of direction add to the excitement but also increase the odds of getting into a wreck. 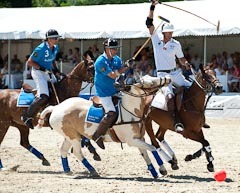 “Crossing the line” is one of the most dangerous mistakes a player can make and its penalized in polo. It’s similar to crossing a cow in a reined cow horse event. 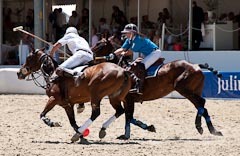 A polo player’s line is between himself and the ball and if another player suddenly cuts in front of that line the results can be disastrous. Experienced players riding solid horses make for a fun safe game. The smaller field didn’t hold back the fun and excitement of the Ascona tournament. The horses were so close and the riders so combative on the field that spectators in the hospitality tents were obliged to cover their drinks. At any moment a stray ball could come flying through the spectator area which really brought the crowd into the game as if they were playing themselves. Nobody seemed to mind a few spilled drinks- they were much more interested in a great day of polo. Comments for "Arena Polo Excitement!" Wonderful! And they are riding some paints. Great article.